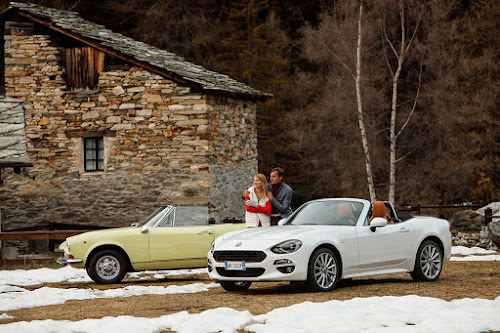 November 3, 2016 marks the 50th anniversary of the Fiat 124 Spider debut. 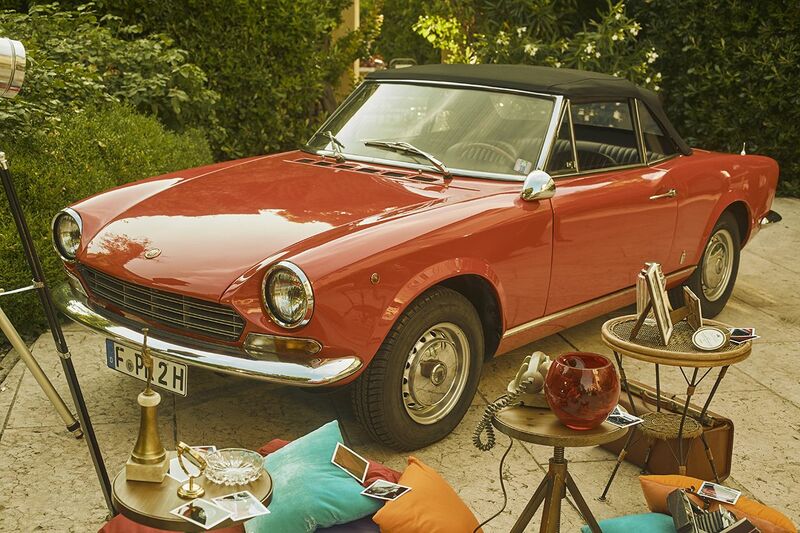 First shown at the Torino Motor Show on November 3, 1966, the striking Fiat 124 Spider was a revelation in refinement, sportiness and sophistication. 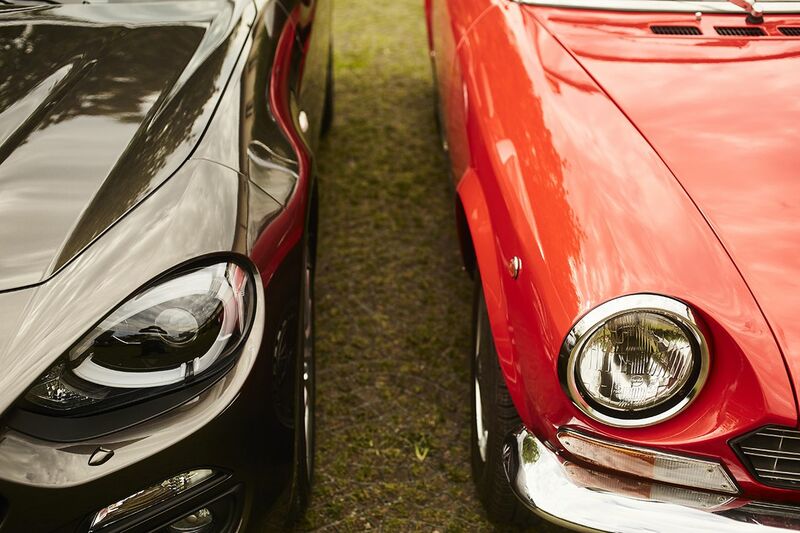 The iconic Pininfarina design would be produced to 1985 and achieve a production volume of 190,000 units, 170,000 of which were sold in the US. There are still some 8,000 124 Spiders registered on US roads today. 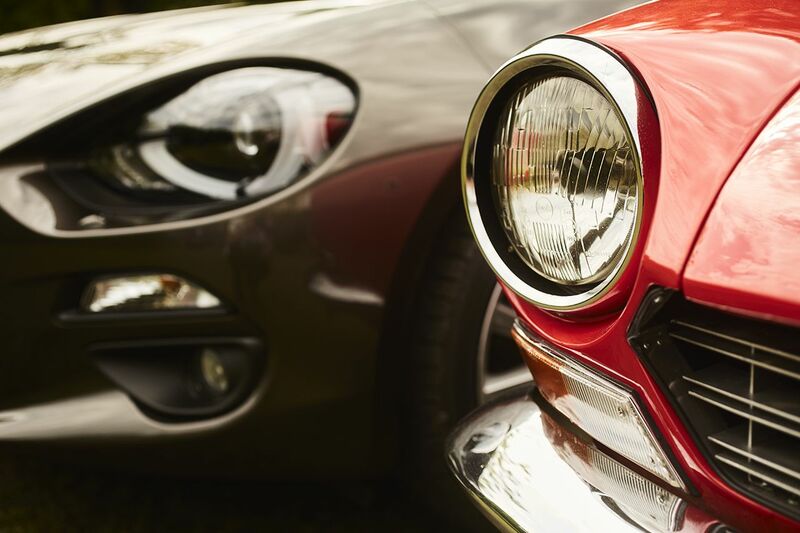 The model picked up most of the mechanics of the Fiat 124 saloon but was designed from the start with some quintessentially sporty features. The name of Pininfarina was in itself a guarantee of design and interior elegance, and as a whole, the 124 Sport Spider stood out for the overall high quality of its finish, its accessories and its colors. 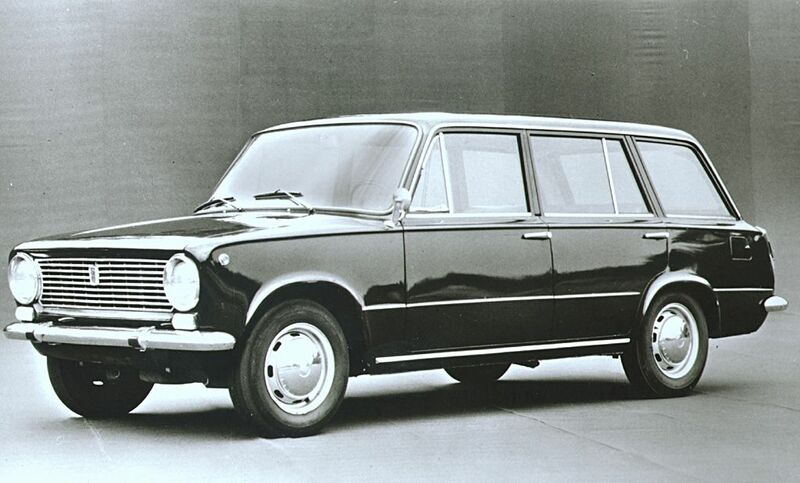 The car was 3.97 metres long, and its exterior style was modern, restrained and well-proportioned. Its streamline side was enhanced by the rear wing that dipped slightly in the connection to the front wing. The front end was flat and compact with a light look determined by the recess housing two slightly retracted headlights. The air intake presented an original hexagonal shape, while the bumpers were stark, wrap around and free from overriders. 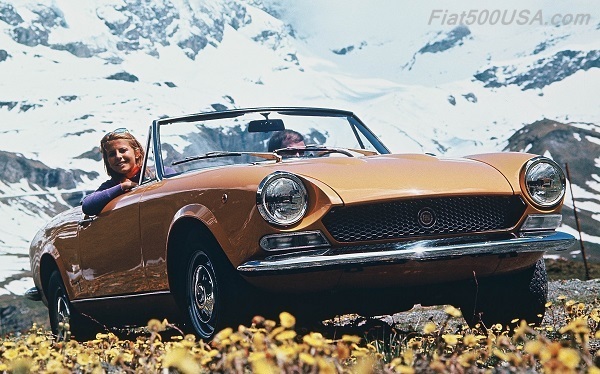 Meanwhile, bolstered by the good market response, Fiat was working on the development of the model that would be launched in the USA in 1968. 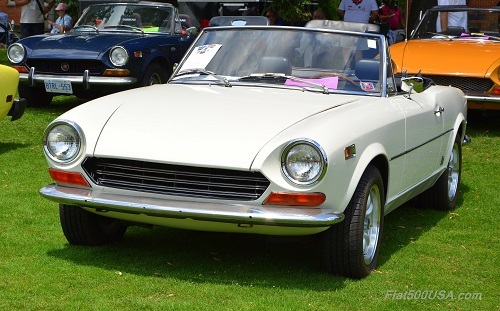 The Americans loved the proportions and quintessential Italian style of the Spider, as its top that could be quickly and easily folded directly from the driver's seat. The second version proper was introduced in October 1969, again at the Turin Motor Show, as part of an overall revamp of the range. It maintained the rear-wheel drive arrangement and the typical sporty driving feel despite the number of cars with front-wheel drive that were being presented in that edition of the event. It could fit either the traditional 1.4-litre or a new 1.6-litre engine. 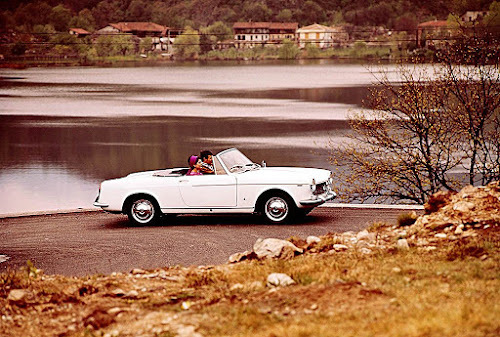 The latter, also with four cylinders and dual overhead camshaft, had two double barrel vertical carburettors: displacement increased to 1608 cm3 and performance was even more brilliant. It delivered 110 HP and reached a top speed of 180 km/h. The braking system was of the independent circuit type. From the point of view of appearance, it had a new honeycomb grille. 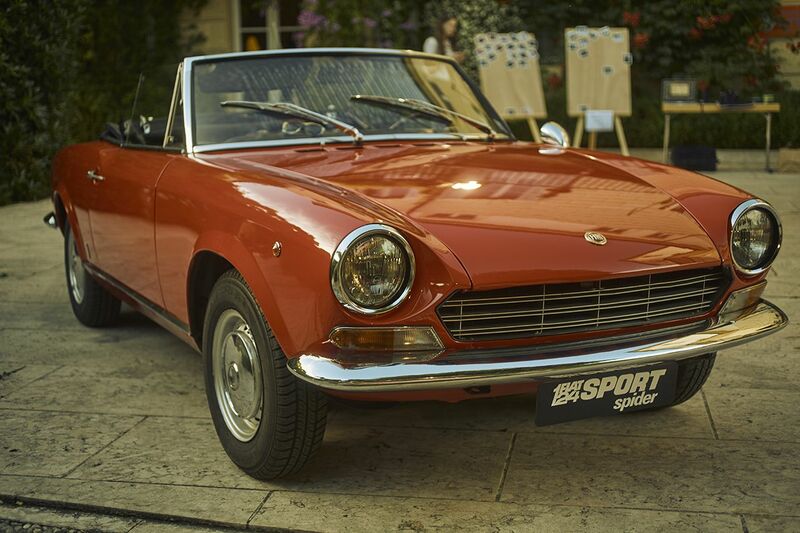 The 124 Sport Spider was successful as a result of its timeless appeal and unchanged driving pleasure despite the social unrest of those years which tended to penalise the showiest models. After 1972 the model would also be remembered for its memorable racing triumphs. Eddy Merckx deserved his nickname of "The Cannibal", winning the Tour de France and the Giro d'Italia, in addition to the Milano-Sanremo and the speed record. Mark Spitz set new world records in all seven competitions he competed in during the Munich Olympics, while Italians Mennea and Thoeni made a name for themselves in track and field and in skiing with the European 100 metres record and the Alpine Skiing World Cup. 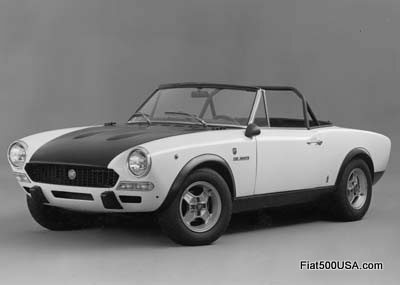 The Fiat 124 Abarth Rally for racing in Group 4 was launched the same year as the street-legal version. 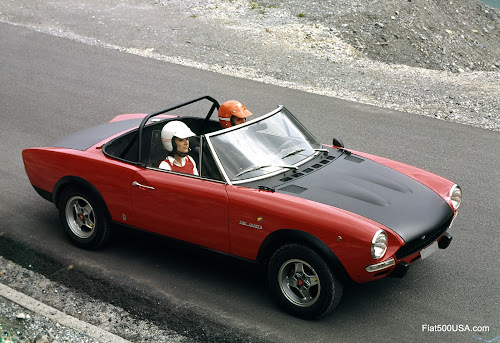 Compared to the standard production model, the Fiat 124 Abarth Rally Gr.4 benefited from a more powerful engine, fibreglass roof and bonnet, aluminium doors and considerable weight reduction. Tuned by the Abarth Racing Team, the car made its début in the 1972 season and continued racing until 1975. Production of the 124 Sport Spider continued from June 1974 until 1982 for exports to the United States where the model was still very successful. The style remained the same. The only change concerned the adoption of energy-absorbing bumpers, as required by US safety standards, and the introduction of a 2-litre 87 HP engine starting from 1978. 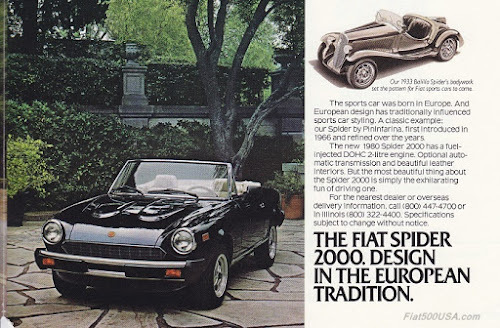 In 1981, Pininfarina displayed a new model called "Spider Europa" at the Geneva Motor Show. The appearance was essentially the same with upgrades focusing mainly on safety and comfort. 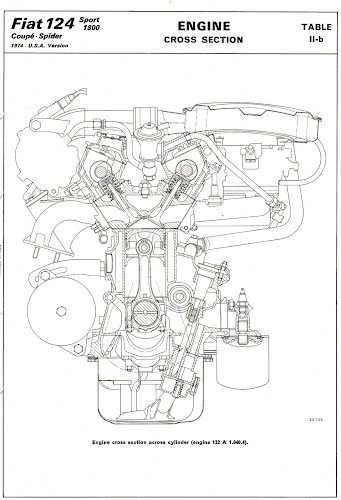 Under the bonnet was a 1995 cm3 twin-shaft four-cylinder engine that delivered 105 HP. Handling was as excellent as ever, and fuel efficiency was improved. The last development came in 1983 with the 136 HP "Volumex" with volumetric turbocharger. 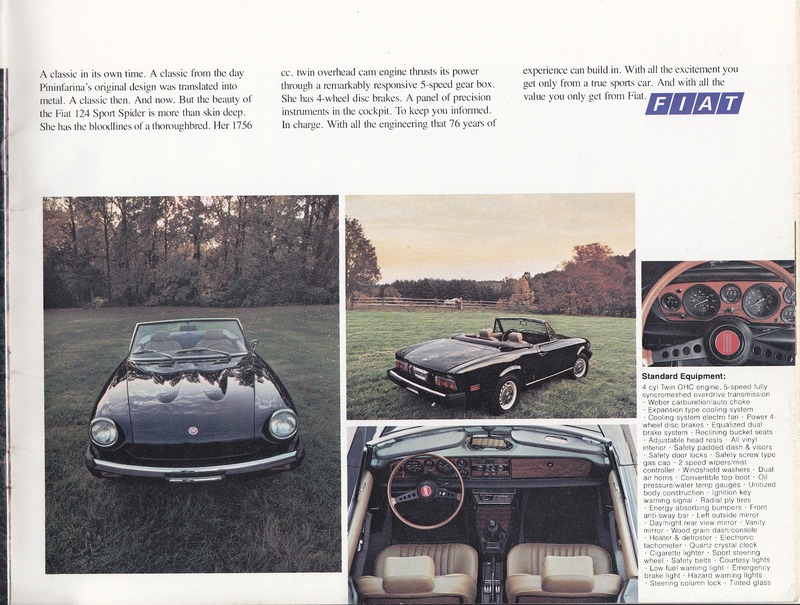 It was designed mainly for the US market and continued the success of the model with over 200,000 units sold worldwide, 75% of which in the USA. 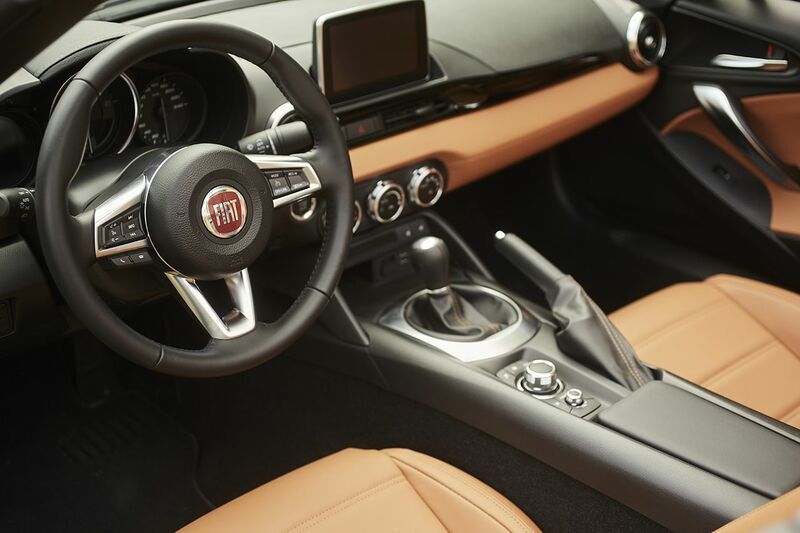 The Fiat Style Centre designers created a car that encompasses the classic beauty of its predecessor without betraying its very essence in a new perspective. The front-end is bold without being aggressive, and the two small humps on the bonnet suggest the engine power. The side proportions are those of a true sports car with longitudinal engine, rear-wheel drive mechanical architecture and retracted cockpit: the design pays homage to the past projecting it into the future. The new Fiat 124 Spider is inspired by some details of its 1966 predecessor and reinterprets them in a modern key. It has a streamlined, timeless silhouette as well as the classic, perfectly proportioned side, the low centre of gravity, the retracted cockpit and the stretched bonnet of a real sports car. References to the vintage model are also found in the upper grille, in the hexagonal front grille pattern, in the classic "humps" along the front bonnet and in the bold horizontal rear lights. Similarly, the upper hexagonal grille was inspired by the exclusive form of the front air intakes on the vintage model and recalls the honeycomb structure of the sporty grille on the legendary 124 Sport Spider. The rear end is characterised by two elements: the swallow-tail section rear wings and the horizontally developed rear lights which wink to the features of its predecessor. The shape of the rear bumpers with the upper surface jutting into the boot lid conveys a characteristic V-shape to the rear end of the car. Interiors are designed and built to guarantee maximum occupant comfort using high-quality, soft materials. 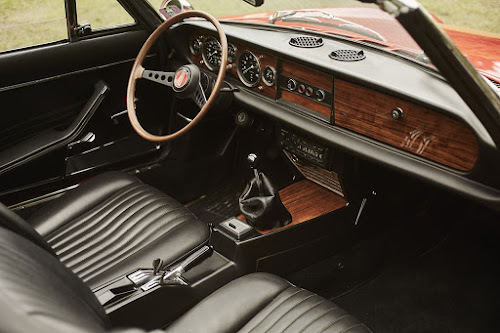 The ergonomics of the car were painstakingly designed to enhance the driving experience, also through the perfect layout of pedals, steering wheel and transmission. 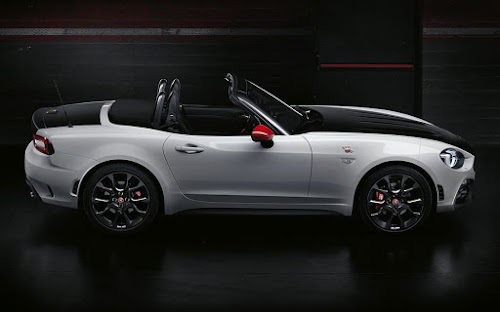 Fiat 124 Spider fits the reliable four-cylinder 1.4-litre MultiAir turbo engine that delivers 140 HP of power (103 kW) and 240 Nm of peak torque available right away at 2250 rpm. The engine has retained its distinguishing features: four cylinders in-line with an aluminium head, a 72 mm bore and an 84 mm stroke, developing a total displacement of 1368 cm3. 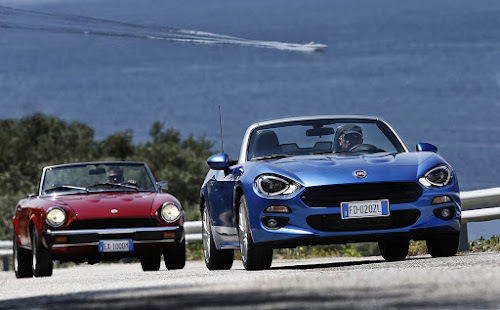 Fiat 124 Spider clocks a top speed of 215 km/h and accelerates from 0 to 100 km/h in 7.5 seconds. The outstanding dynamism of the car is also achieved thanks to the rear-wheel drive, an extremely well-balanced weight distribution and a low centre of gravity. 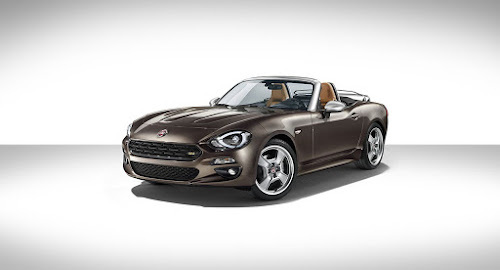 Fiat 124 Spider is available with six-speed manual gearbox for smooth, direct shifting, or with automatic transmission. Suspension and steering are designed for excellent driving dynamics. 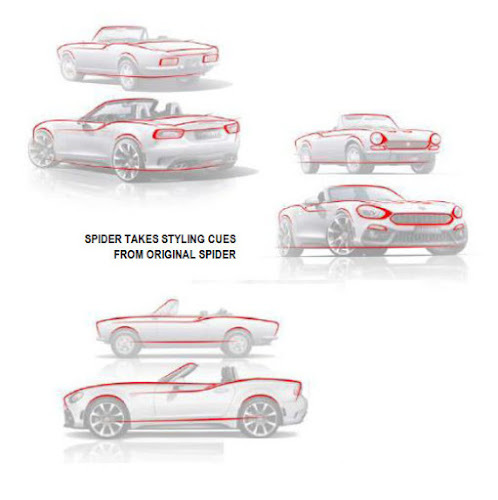 In the front, the new 124 Spider uses an elegant double wishbone suspension arrangement and a multilink architecture for total vehicle control in a curve on the rear. With dual pinion electric power assistance, the steering is light and reactive. As a tribute to the tribute, an example of the new 124 Spider America limited number special series was displayed at the Paris Motor Show. The model is specially equipped to celebrate its namesake that in the 1980s was launched to celebrate the 50th anniversary of Pininfarina. Not by chance, the special series reproduces the magnetic bronze livery of that famous model. 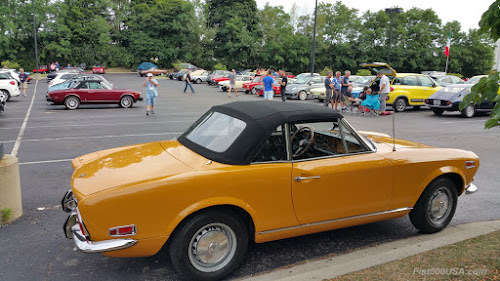 The wing mirror caps are silver color, and the leather interiors are tobacco. 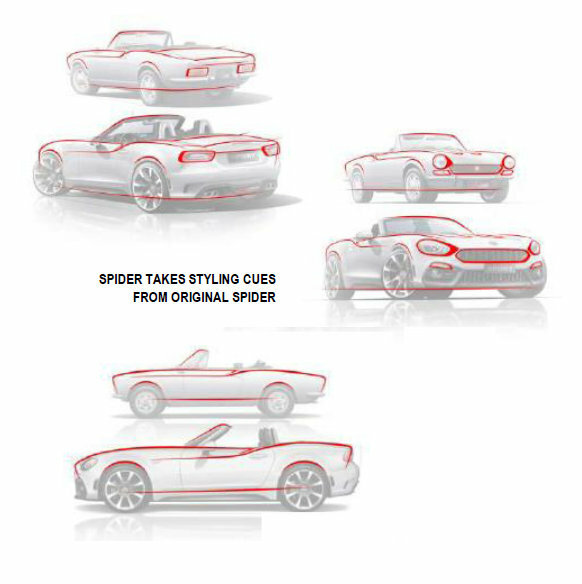 On demand, the new 124 Spider America can be fitted with 17" light alloy rims with a classic design and rear parcel rack. These two accessories were developed by Mopar to enhance the vintage personality of the car. 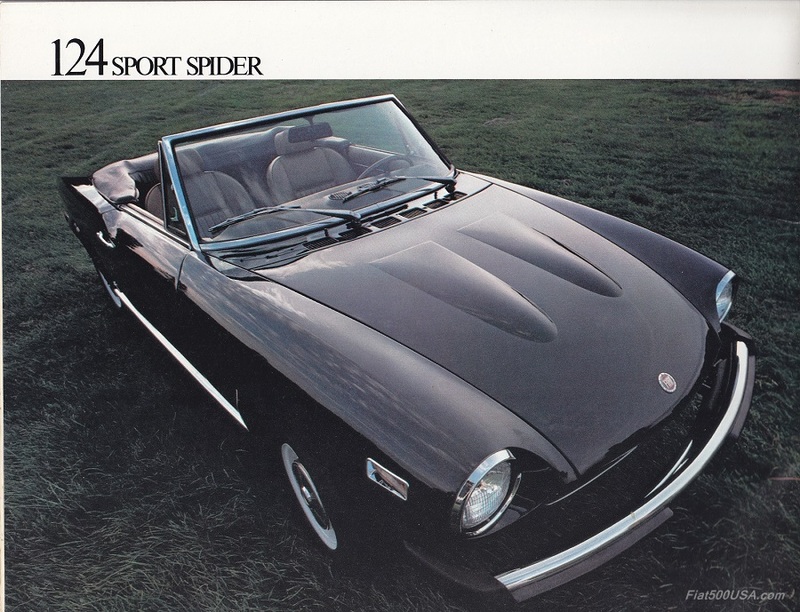 Finally, 124 Spider America sports a celebratory numbered badge and a special badge on the front grille. The six-speed sequential automatic transmission was first introduced in this version. From 1966 to 2016: the fifty years of a legendary model which continues to fascinate with its stylistic developments and constant engineering quality with an eye to its successful past. Growing to improve and reach new goals: happy birthday, 124 Spider.